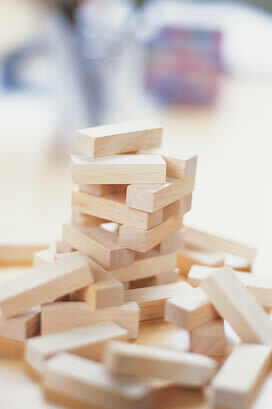 This housing bubble is like a game of Jenga. 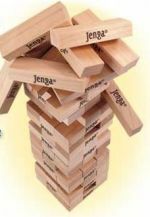 You can see the blocks going higher and higher, you know it is going to fall down soon, but it hasn’t yet…and you just hope it isn’t on your turn when it does! The housing market is the same way right now. Some people pulled out of the tower, and are content. Some wanted to “win”, so they kept taking turns and piling blocks on the top. Some just wanted to stay where they were, but all the people piling on the top forced things like property taxes so high, they were forced to move. BUT, as of right now, the tower is still standing. The “players” are taking more time moving their pieces. Occasionally the ceiling fan rocks the tower and some people yell “it’s crashing!” while others look at it and say the fundamentals are fine…it is a strong table, nothing to worry about, keep piling on. I think this story from Bloomberg says it all. The title is: Housing Bubble Bursts in the Market for U.S. Mortgage Bonds . I’m not going to paste the article here, and I’m sure some of you read it already over on Ben’s blog a few days ago. This thing is really VERY simple. You have 50-80% of borrowers taking ARM mortgages the past few years. These people got loans when rates were crazy low, and lending standards lacked “old school” criteria like verifying income, reserves, penalizing people for BK’s, etc. When these people run out of “fixed” time on their ARM and they look to refi again, they are going to find higher rates (yes, still historically low, but not super low like they had been), and much tighter lending standards because of the article above. This combination of higher rates and tightening lending standards (they ARE happening now) is going to leave people with very few feasible options. If they can barely afford their I/O ARM at 50 and 55% DTI’s (debt to income ratios), what are they going to do?!?!? Between now and then (through 2007), there are about 1.5 trillion dollars of mortgages that will be going adjustible. I’m already seeing the tightening in the MBS markets. I was talking to my manager this week about a loan, and they told me that our investors were demanding a lot, so we could not be lenient with rate and loan exceptions. Very few times the past few years have I ever been told that. The old mantra was “we’ll find a way, we’ll make the exception”, now the mantra is “we’re not going to lose money on that loan”. Only time will tell…but that is where I have my sites set. What do YOU think?!?!??!? I don’t know about you, but I can just picture Cramer doing one of his ‘Mad Money’ rants, and at the end he yells ‘JENGA’!!! Pretty much sums up Wall Street and the world markets at this time. What do you think? I look forward to the comments.